On your trip to Alexandria, you should not miss a chance to visit the Bibliotheca Alexandrina, the largest collection of information in the Ancient World . This Royal Library of Alexandria is a major cultural resource of modern Egypt. It was built in October 2002 honour of the original Library of Alexandria that was destroyed beyond recovery. Library of alexandria egypt is huge project still under progress and aims to have more than eight million books, 15 permanent exhibitions including a planetarium and a manuscript restoration facility. 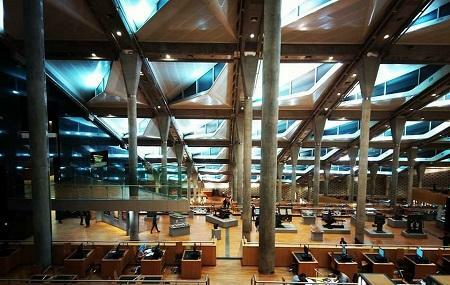 You are bound to be mesmerized by the architecture of Bibliotheca Alexandrina. The main room of the library is directly below a 32-foot tall roof that has glass panels and extends in the shape of a sun dial. The diameter of this structure is 160 meters. The Bibliotheca Alexandrina continually organizes cultural and scientific events every year like Alexandria international book fair, art exhibitions, conferences, seminars, concerts and theatrical performances. How popular is Library Of Alexandria? People normally club together Triomphe Hostel and El Kobba El Samaweya while planning their visit to Library Of Alexandria.